#GSA2015 Day 1: William Smith, Tyrannosaurs, the Chesapeake, Digital Tech in the #Geoscience Classroom, Mass Extinctions… and more. I started this morning by heading off to the Poster Hall (while some people started by waiting in a long line at the Starbucks at the Convention Center!) to read through some fascinating approaches to geoscience education teaching and research. Although the posters are up all day, the speakers only have to be at their posters for a couple of hours in the morning or afternoon, depending upon when their session is officially taking place. The sessions I wanted to see were afternoon sessions, but since I have a meeting on my schedule later today, I took advantage of at least going through and reading the posters (students, this is why we work with you to find just the right balance on your posters – you don’t need to put everything on there, but just enough so that if you are not at your poster when someone comes by, they can still get a great snapshot of your work). Below, I’ve included some photos of the Poster Hall (I couldn’t fit all 493 posters that were on display today, but hopefully, you’ll get a sense for the 4 foot x 8 foot displays). Some of the posters I found really interesting included The Pet Rock Project (which is fully described on the SERC website), ergonomic health, and student procrastination (where their study said that engaging in procrastination is not problematic for student learning). I caught one talk this morning on a topic I have been hearing about and wanted to see what the leaders of the project had to say. The title of the talk was “THE BEARDED LADY PROJECT: A CREATIVE RESPONSE TO GENDER STEREOTYPES IN PALEONTOLOGY,” and the talk showed a video preview from the documentary being created to challenge sterotypes and call attention to female paleontologists. To “challenge the face of science,” The Bearded Lady Project is interviewing women and also taking portraits of them in the field wearing beards. Their intended audience for seeing the documentary and portraits includes young women (encouraging them to become paleontologists) and men that can advocate for women to be accepted in this career field. The video producer and photographer, both females and underrepresented in their own disciplines, hope that their concept of bearded women expands to other scientific fields. But is putting a beard on a woman’s face uniting the community of women, or causing discomfort? Personally, I’m having difficulty understanding why we need to have photos where we make women look like men. I am extremely concerned that a younger female audience will interpret this as they are expected to be more “male” to be in this career field and accepted. Other people in the audience were also questioning the beard. But, in the end, this is certainly generating conversation around women in paleontology. It will be interesting to see how the documentary and discussion of bearded women continues in the future. 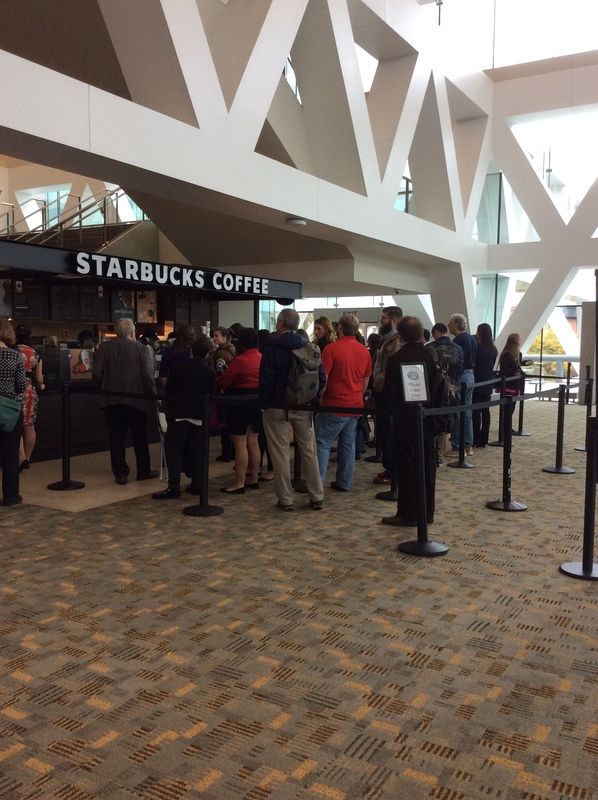 If you want to read more beyond my quick notes, you can follow the meeting hashtag #GSA2015 on Twitter – several geologists that couldn’t attend the meeting are doing just that! 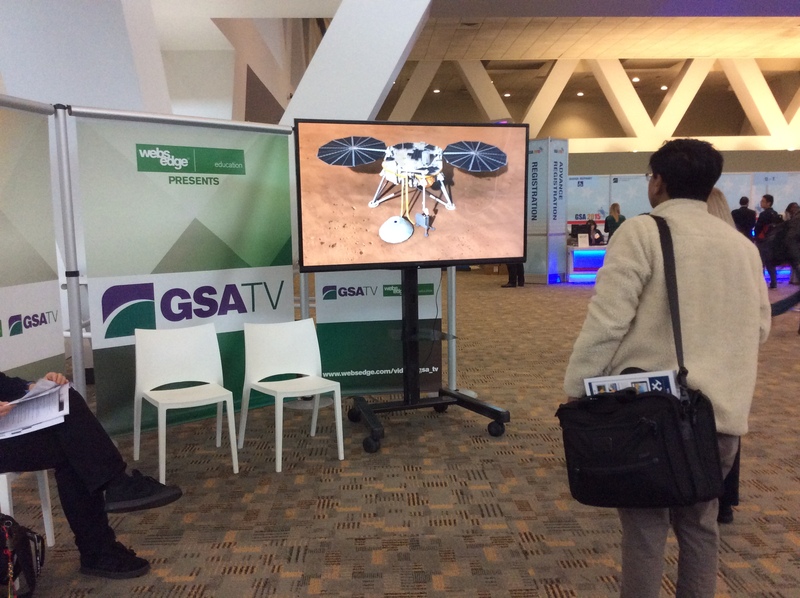 And there is also a unique opportunity to see some videos that describe geoscience research on GSA TV, “broadcasting a new daily show bringing together thought leaders and newsmakers from the meeting and leading organizations from around the world.” GSA TV is showing on screens in the Convention Center, in select conference hotels, and online (see the YouTube playlist). I'll be checking in on #GSA2015 throughout the day. I love being able to attend conferences thru live tweeting. Go Tweeters! Next up…. lunchtime lecture, awards ceremony, and GeoCUR Business Meeting.